Finding the right professional for your specific needs can make the difference between achieving quality results and dealing with crushing defeat. From the car mechanic to your dentist, it’s crucial to procure the perfect specialist for the job. As a top team of drywall contractors in Chicago, AZ Drywall Finishing is here to put your worries to rest. Since 1999, our drywall company has worked to provide the absolute best services in the industry, delivering satisfaction at every step and gaining lifelong customers. We understand the stress that can come with finding the perfect drywall finishers for your commercial or industrial project. Today, we’ll conclude our last blog by discussing a few key questions to ask your potential drywall contractors. This way, you’ll be able to rest easy knowing that the end result will be superior in quality. When Do You Accept Full Payment? The process of paying your local drywall contractor can be a big factor in determining their integrity. One issue that numerous homeowners have faced occurs when a drywall company takes all of the payment up front for all of their services. Once this is done, that contractor may be as easy to reach to get the project completed as a ghost. A number of rogue companies have been known to travel around offering top-quality drywall services with the requirement of full payment up front. After payment, they flee the scene and never come back. Don’t let this happen to you! Ask about the payment options available from your potential drywall installers. Installment plans are nice, but a majority of the payment should be dispensed once the job is done and done well. Protecting against any defects in their workmanship should be a standard part of any reputable drywall company’s plan. Often times, these small defects will not be discovered until after some time has elapsed. Finding a company with a comprehensive warranty is essential for guaranteeing that you are happy with the results. AZ Drywall Finishing leads the industry by offering a 2-year warranty on all of our drywall services. This way, you can rest easy knowing that your walls will be perfect, no matter what happens! How Many Other Jobs are You Currently Working on? 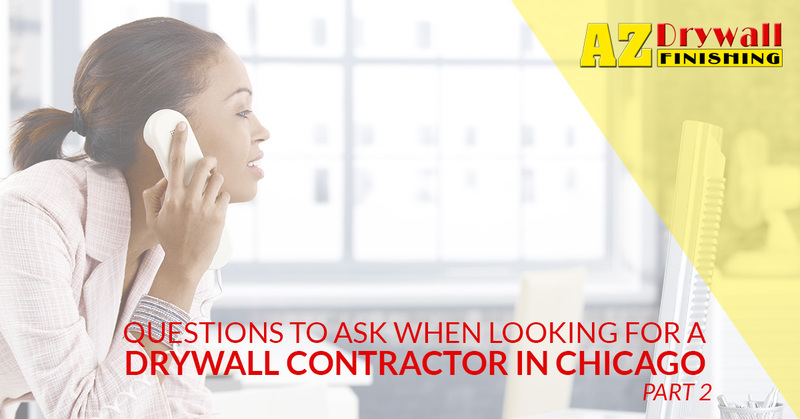 Hiring on drywall contractors for your Chicago project can prove troublesome if they are overbooked and overworked. The more jobs a drywall company takes on, the less time they’ll have to focus on the precision and quality of your structure. Lowered quality and longer finish times can end up costing you big! Finding the ideal company for your drywall installation and finishing can make the difference between a costly failure and a smashing success. As such, it’s important to do your research and ask the right questions when finding top-notch drywall contractors in Chicago. When you’re ready, be sure to call AZ Drywall Finishing for an interview! Our experienced employees have the expertise and equipment to provide professional results every time. From stud framing to painting and finishing, we’re here to make your commercial property shine. Contact us today for a quote on your project or to talk to our contractors about your project!